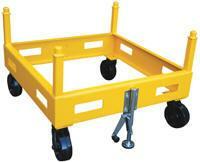 These racks provide versatility, efficiency, and durability. Great for transportation and storage. Remove or change post height depending on application. Double post pins provide support up to 4,000 uniform pounds stacked up to five (5) units high; three (3) high on 24" and 36" models. Large target and pintle for speedy alignment. Rugged welded steel construction with powder coat yellow finish. Four-way fork entry on all models. Custom sizes and configurations are available upon request. Model V-1 (Pic. 1), has four adjustable-height non-removable posts, fixed base targets, 4-way entry, and solid steel deck. The usable height adjustable in 1" increments from 11 1/4" to 17 1/4". Model V-2 (Pic. 2), is a versa rack base only with no posts. Sockets included. Model V-3 (Pic. 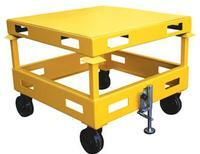 3), is a stand/cart which has 8" phenolic wheels and flor lock. Features 12"H non-removable fixed-height corner posts. Overall height 30". These carts may be stacked no more than 2 units high. Model V-4 (Pic. 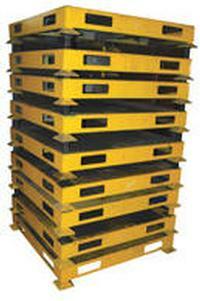 4), is a versa rack pallet with no posts or sockets. Solid deck steel pallet is great for durablity. 4-way entry for convenience.